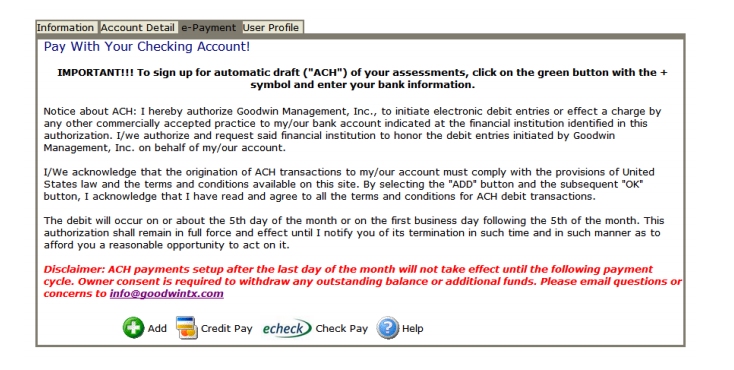 Visit our website www.goodwintx.com to login to your HOA account and view your statement and payment options. Once you are on the website, you will select your community from the drop down box on the bottom left hand side of the screen, select “go” to open your community’s homepage, and then select the blue login button on the left. Enter your login credentials and click the arrow. All of your account information is listed on the left side of the screen and all of your community information and contact forms listed on the right side. Tabs are located on the top to view more detailed information. To Setup Automatic Draft (ACH): Select the green +Add button on the bottom left located under the ePayment tab, click ok to the accept message and enter your banking information. Select save to ensure your information has been retained in our system. To modify your current ACH information hit delete to clear the current information and reenter. Please be sure to hit save when you are done. **NOTE: Your first draft will take place on or about the 5th of the following assessment period. To cancel your ACH draft simply hit delete and ok.
To Pay by Credit Card or E-Check: you will simply select the corresponding icon. After selecting your payment option you will redirected to the third party payment processor site. Please note credit pay and echeck payments are subject to a processing fee. Lakeside WCID #1 holds monthly meetings on the second Tuesday of the month from 7 to 8 pm at the Blackhawk Amenity Center. Residents are welcome to attend.